Pre-5G, telecom capital intensity is on the rise (see graph below) despite much of the world’s telecom real estate sitting in already mature markets. This is both surprising and worrying. 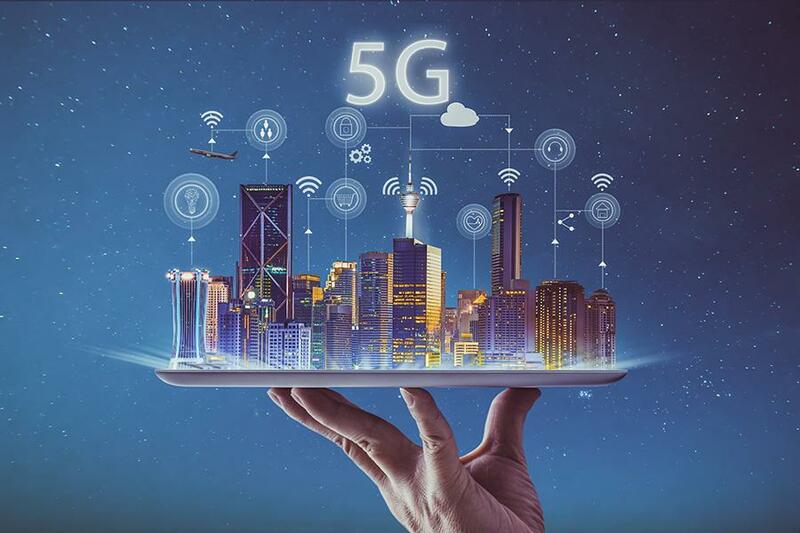 It is also a signal of worse to come, since 5G technology is expected to result in an increase in annual investment to achieve the network “densification”. Some estimates claim that a fully deployed 5G network may contain as much as 10x the number of network assets as a 4G or LTE network in the same coverage area. The 5G kit will be lighter and smaller (neatly referred to as “street furniture”) and deployed in stages and hotspots but nonetheless, the costs will add up. Under the current business model, telcos’ rising capital intensity is destined to go hand in hand with falling capital returns (see graph above). Globally telecom players are experiencing flat revenue growth and with increasing competition, a threat of further commoditization in their mobile and fixed businesses. Profitability is stagnant and as a result, returns are dropping. There are a few exceptions here and there, such as outstanding companies who are reinventing cost structures through radical transformation, and others who are maintaining premium pricing through network and service advantages. 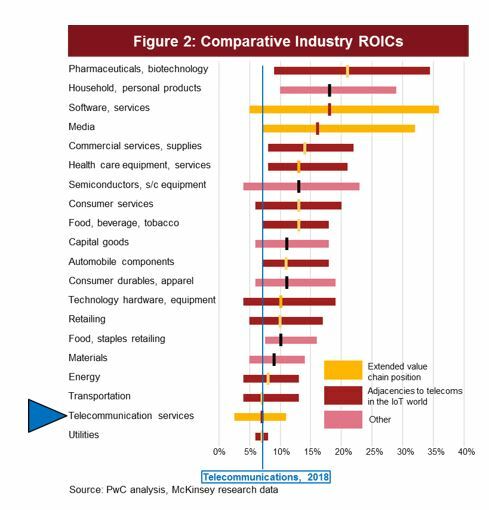 But in general the telecom industry is approaching the bottom of the ladder when it comes to comparative industry returns (see Figure 2). Even the players who are bucking the trend will not be able to sustain their trajectory. For any telco that wishes to avoid being classed by shareholders as a utility, strategy has to focus on how, not whether, they will move across the industry value chain so that they may participate in the profit pools available in more lucrative industries, such as healthcare, software and ICT services and media (see Figure 3). There are no two ways about this, yet only a few telecom player boards truly appreciate the urgency to change enough to give CEOs and their management teams the right balance of encouragement and pressure. Moves across the value chain are made possible in the 5G world because it offers vast new possibilities. Due to its superior qualities as a connectivity technology, 5G will enable telecom operators to revolutionise current performance in mobile connectivity, to offer massively higher speeds, higher capacity to carry more traffic and therefore lower costs per megabyte, and an ability to “slice” traffic so that differentiated connectivity can be offered to customers in the same coverage area. These advantages will enable operators to offer new types of services to customers, such as home automation and enterprise productivity solutions using IoT technology, and always-on media and content onto any screen, meaning that telcos’ could soon be serving not only the world’s 7 billion people but also connecting billions more devices to each other. The potential for network slicing will create possibilities for service and price differentiation across this vastly disparate user base – something that operators could exploit whilst maintaining the minimum service quality metrics that the national telecom regulators will demand. Operating economics will improve due to lower per megabyte traffic costs, and at the same time broad and new profitable revenue opportunities will open up. Only radical changes to business models and supporting capabilities will let telecom operators achieve the dream promised by 5G. Only those operators who patiently invest the time, money and effort in building the capabilities required to move into such new services will prosper. Vodafone, for example, announced today their US$23bn merger with Liberty Global in Europe to create Europe’s largest fixed-mobile integrated network operator which will be able to deliver converged services across the EU. AT&T announced last year their acquisition of Time Warner, and Verizon has made important investments into its advertising and internet capabilities through acquiring Yahoo! and AOL. In emerging markets, Axiata in Asia has made numerous digital investments in an attempt to develop competencies in new areas adjacent to the business of connectivity. Whilst Indian operators have done much to optimize costs and build usage and revenue growth, they are yet to face the challenge of diversifying their business away from connectivity. Many telecom operators still appear to be debating what to do or, perhaps worse, undertaking trials and pilots which showcase progress and capture a few headlines but achieve little of long-term substance. Telcos must move into other spaces before others move into theirs. Territorial definitions based on the industry boundaries of the 20th century no longer apply. The CEO of Nissan was quoted recently as saying that auto manufacturers cannot afford to be car companies any more: they have to be tech companies too. As the 5G investment cycle scales up there is much to be gained and lost: a sharp right turn along the value chain is needed to emerge a long-term winner. Telcos for years avoided becoming a “dumb pipe”: now they can become a smart pipe and use it.